In the half-century that followed World War II, Atlanta transformed itself from a provincial crossroads into the host of the largest peacetime gathering in world history, the 1996 Centennial Olympic Games. This breakneck metamorphosis was largely the work of a handful of powerful men, embarrasses by the nation’s scornful dismissal of the South and determined to see Atlanta command respect on an international scale. 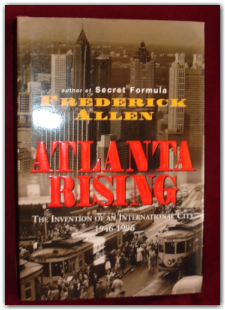 Names that most Atlantans know as landmarks or figureheads—Coca-Cola magnate Robert Woodruff, visionary mayor William Hartsfield, Dr. Martin Luther Kind, Jr., Ambassador Andrew Young, Olympic organizer Billy Payne—Allen reveals as the forceful personalities who, for better or worse, bent Atlanta to their private visions. With a wealth of candid quotes and telling anecdotes, Atlanta Rising is more than an eye-opening portrait gallery than a fact-heavy history. For visitors and recent arrivals, Atlanta Rising will serve as the essential primer on the ins and outs of the South’s capital city. For natives, the book offers up a rich menu of surprising new facts and fresh insights about their own hometown.